Android phones have been getting bigger and bigger, and that's not everyone's cup of tea. As Motorola said at unveiling of the Droid RAZR M, "Some people just want a smaller phone." Does this phone, designed to fill that niche, still deliver on performance? A relatively small, thin, $100 Android phone that runs on Verizon's LTE network. People who want an Android phone that even fits into skinny jeans. Super solid—hard metal body, laminated Kevlar back, and 4.3-inch Gorilla Glass. Dense, and very thin, with no bezel. Just 8.3mm (0.327 inches) thick. It's fast. It absolutely screams on Verizon's LTE. Call quality was good, and the speakers are nice and loud. Motorola's skin is pretty close to plain Android, which is a good thing. The size. The main differentiating factor isn't a gimmick—it feels good to use. 4.3 inches is plenty big for most purposes, and you can reach every part of the screen without straining your thumb. The camera. The results are terrible—reds bleed together, it struggles with contrast, the focus is inconsistent, image stabilization is basically non-existent, and tap-to-focus doesn't adjust the brightness. It's sometimes possible to take a nice, sharp shot, but it's tougher to do so than it should be. Click for sample photos/video. The back has two panels. The larger Kevlar panel, then a smaller glass panel where the camera is. It's very reflective, almost mirror-like. Maybe for helping you frame your self-portraits? The 4.3-inch screen is pretty low resolution. 960x540 gives it a pixel density of 256ppi. There's definitely a been drop-off from a 720p screen. That said, it's not a bad screen, it's just nothing to write home about. This phone got some of the fastest speeds I have ever seen come through 4G. Peaks of 29Mbps download and 18Mbps upload. That's three times faster than my cable internet , which makes me want to cry. This phone actually has NFC! That's not something you generally see in a "mid-range" phone. We were able to use Google Beam to send photos, sites, and maps back and forth. Google Wallet isn't available for this phone yet, though. It's pretty incredible that Moto crammed a 2,000mAh battery into this thing. It always made it past midnight, even with gaming, GPS usage, and other abuse. 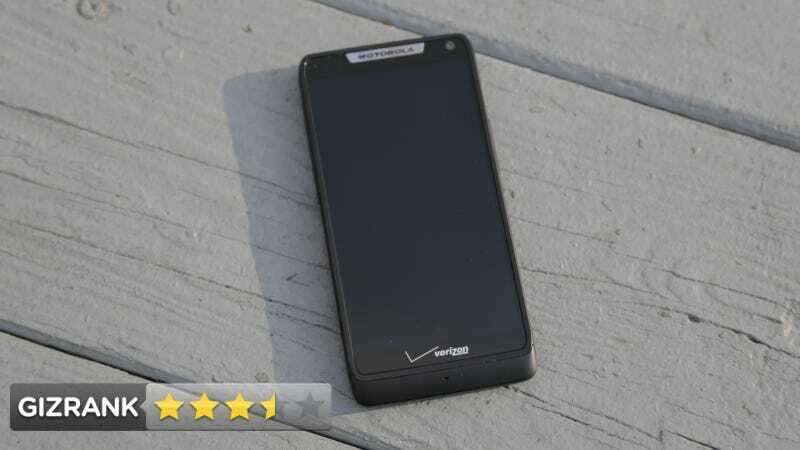 It's not the 2,500mAh battery on the forthcoming RAZR HD, or the dreamy 3,300mAh battery on the RAZR MAXX HD, but it's still very good. On the software side, it comes pre-installed with a fair amount of bloatware. Most of it is stuff you can disable, or just ignore. Most of Motorola's customization is inoffensive, however, there are some settings that are on by default and lead to excessive notifications. Also, while you can reorder the pages on your desktop, you can't change which is the default, and that's annoying. The phone only has 8GB of built-in storage, which you can fill up pretty fast. There is a micro SD card slot, so you can theoretically add another 32 or 64GB of storage. Got caught in a major downpour with this thing and it worked just fine, giving some credence to its "splash-proof" claims. There is the occasional lag and stutter. It ships running Android 4.0 (Ice Cream Sandwich), and hopefully this will go away with the Android 4.1 (Jelly Bean) update, which is expected by the end of the year. We got to play with one running an early version of Jelly Bean for a second and indeed it seemed much smoother. Yes, especially if you've been wanting a smaller phone that still has plenty of horsepower. But the camera is a downer. And if you do a lot of reading, gaming, or video watching on your phone, you might want to go with a larger 720p screen. The Droid RAZR HD and MAXX HD, with their prettier screens and bigger batteries, will certainly be tempting (especially if they have better cameras than this one). All in all, though, this is a terrific phone for a hundred bucks.